Concrete is the most commonly used construction material and has been in use since about 500 BC. In 2006 alone, it is estimated that between 21 and 31 billion tons of concrete has been used and is the second only to water as the most used substance in the world. Concrete is a mixture of numerous ingredients: Portland cement, water and some type of both small and large-sized aggregates. A typical mix of concrete is 10% to 15% cement, 5% to 8% air, 10% to 20% water and 60% to 75% aggregates. Concrete is malleable when it is freshly mixed. Through the chemical reaction of hydration, the mixture hardens and gains strength. In fact, concrete continues to harden from the day it is poured and never stops. Concrete can be cast-in-place or cast in a factory (pre-cast) and then taken to the job site for placement. Pre-cast concrete has a number of advantages including that it is made independent of weather conditions, it has been subjected to quality control over dimensional accuracy and properties, and is made using accurate and accountable methods. Cast-in-place concrete is a widely used method for many applications ranging from concrete sidewalks to highways to skyscrapers. It is also the least expensive and most flexible method. Concrete’s compressive strength is excellent but its tensile strength is relatively low. Concrete is divided into two basic categories- normal weight concrete and lightweight concrete. Lightweight concrete is used when it is important to reduce the weight of a building. The difference between normal and lightweight concrete is the weight of the aggregate used in the mixture. Normal weight concrete weighs about 150 lbs per cubic foot and lightweight concrete weighs about 115 lbs per cubic foot. Concrete can have a compressive strength ranging from 2,000 psi to 20,000 psi. The term green concrete describes concrete that has not reached its designated properties. It usually takes about 28 days after being poured for concrete to meet the expected properties. The size of the aggregate in the concrete does have an effect on the holding values of concrete fasteners. Concrete that is poured with more dense and harder aggregates tended to yield greater holding values in tension. There are a number of considerations that need to be taken into account before drilling and inserting a concrete fastener into concrete. Make sure the anchor is a minimum of 10 times the diameter away from other concrete anchors and 5 times the diameter from all unsupported edges. Always make sure the concrete anchor’s embedment depth meets minimum embedment depth requirements for the type and diameter of the anchor being used. Make sure the hole is cleaned out of all debris before inserting and setting the anchor – use of compressed air and a wire brush can accomplish this. To determine the length of the anchor needed for a particular application, add up the minimum embedment required, plus the thickness of the material to be fastened, plus space for the nut and washer. The sum will provide the minimum length of anchor that should be used. Concrete blocks, also known as cinder blocks, are manufactured as a solid block or block with hollow centers. The concrete block with hollow centers has reduced weight and improved insulations. A typical block measure 8” x 8” x 16”. High-density concrete blocks are manufactured from cast concrete, i.e. Portland cement and aggregate, sand and fine gravel. Lower density blocks, known as cinder blocks, are made using cinders as aggregate. This mixture of cinders with the Portland cement makes the blocks lighter in weight. They may be less expensive than block made with sand or fine gravel as the aggregate. Some advantages in using concrete blocks in construction include: they are durable, fire resistant and require low maintenance. Disadvantages of using concrete blocks are that they are labor intensive, heavy and absorbent. The concrete block may also be reinforced using vertical or horizontal bracing. The horizontal bracing is made from steel and is placed between the course of the block in the mortar joints. The vertical reinforcements are usually steel rebar placed in the hollow core, which is then filled with grout. Fastening to concrete block can be done in the block itself or into the mortar joint. Concrete Block is a very porous material and the holding values can vary drastically. Whether the anchor is placed in the solid section or hollow section of the block will also affect the holding values derived in any given application. When an anchor is placed in the mortar joint, the holding values will depend on the quality and quantity of mortar. Brick is typically made from clay. Some bricks have hollow cores and others are solid. Brick is most commonly used as a façade to a building, not in structural applications. In older buildings, brick was used for the structural walls and multiple widths of solid bricks were used. Sometimes three or/and four different widths of bricks were used to make the wall. Most bricks are very hard, abrasive and brittle, however, some older bricks are very soft. Brick is the oldest construction material that is manufactured. The oldest brick ever found is about 6,000 years old. The standard size brick is 2-1/4” x 3-1/2” x 7-5/8”. When bricks are used for a façade of a building, they are tied to the main structure using brick ties. These brick ties are made from steel and are inserted between the course of brick and then mechanically fastened to the main structure. It is very important when fastening heavy objects to a façade wall that the item is anchored to the main structure, not to the brick itself. 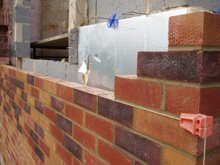 Fastening to brick can be done into the brick itself or the mortar joint. Block is a very porous material and the holding values can vary drastically. Whether the anchor is placed in the solid section or hollow section of the block will affect the holding values derived in any given application. When an anchor is placed in the mortar joint, the holding values will depend on the quality and quantity of mortar. When beginning a fastening project, it is important to understand the difference in installing anchors into different base materials. The process and holding values will differ depending on the base material used. The above information will help you determine how to use concrete anchors in your unique application.